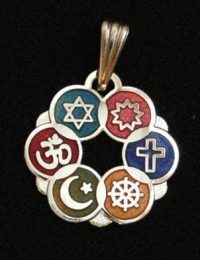 The interfaith lanyard Key chain features the symbols from six world religions. These lanyard key chains are durable, useful, and bulk-priced so you can give them out freely. Short lanyards with a carabiner at one end and a split ring at the other are the most convenient way to keep from losing important items like keys, phones and electronic devices. The key chain lanyard is printed on both sides, and matches our long neck lanyard. The ring is big enough to hold a lot of keys, and the 2″ carabiner is big enough to clip onto a fairly wide strap. The interfaith lanyard Keychain features the symbols from six world religions. You will love one for yourself. It is also the perfect low-cost gift that people will use every day. 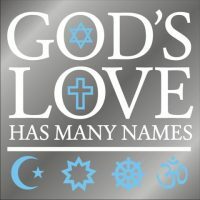 It also spreads a message of interfaith fellowship. These lanyard key chains are durable, useful, and bulk-priced so you can give them out freely. Short lanyards with a carabiner at one end and a split ring at the other are the most convenient way to keep from losing important items like keys, phones and electronic devices. Ours include the symbols for six major religions on the colorful strap. It is printed on both sides, and matches our long lanyard. For just a little more, consider our long lanyard necklace with detachable clip, or the lanyard set that includes both matching lanyards with an interfaith theme. The long lanyard helps create a sense of group identity at the beginning of an activity, and the set makes a nice thank-you gift at the end.